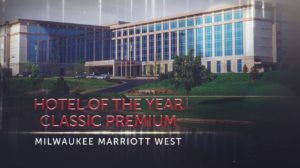 Congratulations to Milwaukee Marriott West for taking home Marriott’s 2017 Classic Premium Hotel of the Year award! The entire team at the hotel, led by Keith Kramar and Maureen Devalkenaere, works tirelessly to make sure every guest has the best experience possible at their hotel. Thank you for continued dedication to your property and CSM Corporation!